I needed to create a visual schedule for my classroom at school. I had used one before, but I didn't like it because the times were digital and my clock at school is analog. My first graders don't know time to the quarter hour yet and it was confusing. So, I made a new one with analog clocks. I couldn't find a blank analog clock in the clipart I own. So, I had to make that first. 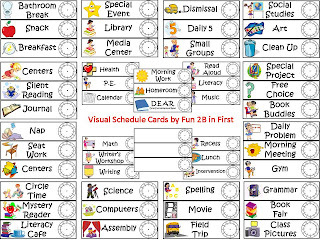 Anyway, I have posted my visual schedule cards on my TPT store for $4.00. The set includes 54 cards! 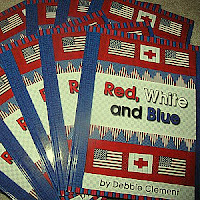 Also, I wanted to share with you that Rainbows Within Reach is having a book give away of Red, White, and Blue by Debbie Clement. 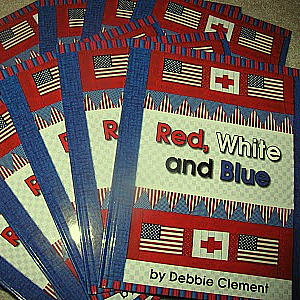 It is a picture book resource for honoring September 11th. I was studying abroad in Coasta Rica on September 11th. I came out of my class at the University of San Jose and was returning to my host family's home. People kept asking me how I was. As I responded that I was fine, they kept telling me that I was not okay and then going into a rapid discussion of bombs, attacks, and New York. It was very confusing. I thought I had forgotten my Spanish or lost my mind because I just couldn't follow the conversations. It didn't make sense and people kept telling me New York was gone. When I got back to my host family's home and saw the television it all clicked. I ended up coming home early from my trip because I did not like being unable to return by air while the boarders were sealed and the idea of traveling solo on a bus did not seem safe. What were you doing on September 11th and will you be doing anything related to it in your classroom? Thanks so much for sharing about my book. I honestly believe it can be a resource that teachers need to bring some appropriate expression to the observation of 9-11 for their young students. I'm very grateful for your support & encouragement. Hope that your new year unfolds with ease and excitement!